The U.S. automotive base has steadily migrated southward. As OEMs and top tier providers have inundated the Southeast, suppliers in the traditional Midwest vehicle stronghold have had to come to grips with lengthening supply chains, and the need to stay engaged and immediately available to now-distant customers. 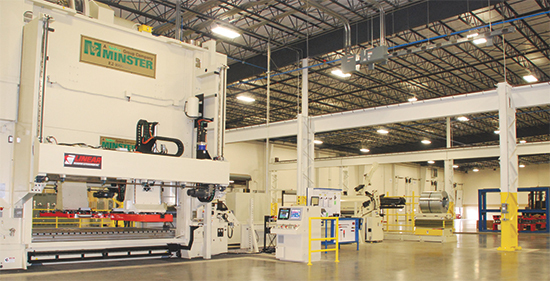 The largest of three new press lines at Hatch Stamping Co.’s new plant in Portland, TN, is anchored by a 1000-ton Nidec Minster press and fully integrated feed system. This line, and the others, allow Hatch Stamping to fulfill current work for its Southeast U.S. customers while providing flexibility to accept a range of new jobs. In exploring its options, Hatch Stamping conducted a six-month study of customer and OEM locations in the region as well as areas with good talent pools. This past April, after eight months of toil adding infrastructure, access and beefed-up utility service, a new plant has emerged. The massive, pristine interior is dominated by 250-, 350- and 1000-ton press lines from Nidec Minster, Minster, OH. The three lines, complete with coil-handling equipment as well as a transfer system on the 1000-ton press, give Hatch Stamping flexibility in servicing current customers and the ability to accept a range of new business. “Overall, the lines allow us to run a variety of materials, from cold-rolled to standard hot-rolled to high-strength low-alloy steels,” explains Stewart Claucherty, Hatch Stamping engineering manager. “We also can run dual-phase, stainless steel and aluminum. “With such a range we can meet the needs of many customers,” he adds. Mirroring production at its other plants, Hatch Stamping will transform these materials into all sorts of parts including automotive seat-assembly brackets, tracks and seat-related mechanisms; ABS and other braking components; and fuel-system brackets, straps and rings. 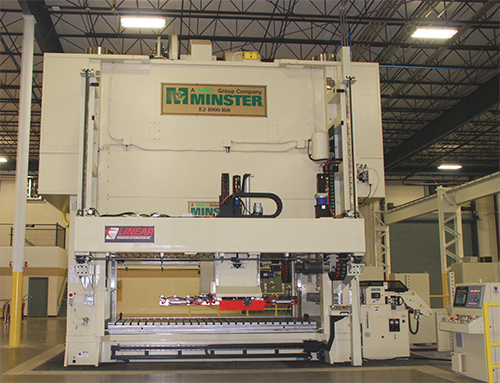 The press lineup includes a Minster E2H standard mechanical 250-ton press, selected for its robustness and minimal bed deflection, enabling production of tight-tolerance parts that require coining and high-impact forming. The E2H 350-ton press features Minster’s alternative slide motion (ASM) technology. The 250- and 350-ton presses have 47 by 120-in. beds, along with automated feed lines that accept stock widths to 32 in. in thicknesses from 0.020 to 0.25 in. These turnkey lines also feature integrated control that runs all components from the press console. The largest press, Minster’s E2 1000-ton unit, provides a 72 by 168-in. bed and will produce parts at full-tonnage speeds from 17 to 35 strokes/min. at Hatch Stamping. The line can feed material in thicknesses from 0.030 to 0.375 in. and has been augmented with transfer capabilities. An LTA-FR front-to-rear transfer system from Linear Transfer Automation Inc., Barrie, Ontario, Canada, was installed after the 1000-ton press arrived, and offers Hatch Stamping flexibility in production and die change. The 1000-ton press features an LTA-FR front-to-rear servo-driven transfer system from Linear Transfer Automation Inc., Barrie, Ontario, Canada. The system gives the stamper conservation of window space; extra lift height to ease die changeout; and independent control of transfer movement on each side of the press that provides options in part routing. The system, mounted on the front and rear of the press, provides rigidity and servo-motor control of all axes, important for Hatch Stamping’s high production speeds and need for part accuracy. Standard features include touchscreen control with master encoder feedback, storage of multiple tool recipes and programmable part detection. Claucherty identifies three features in particular that suit the transfer system to Hatch Stamping’s needs: conservation of window space, extra lift height and independent control of transfer movement on each side of the press. Transfer bars do not drive through the press window with this system configuration. That conserves daylight space and allows Hatch Stamping to run wider product. Extra lift height is provided through the system’s Z2 lift option—it can park 13 ft. in the air to enable access for large dies and fork trucks. This option significantly assists in die changeout at Hatch Stamping. Independent control of transfer movement enables a part to be formed in one direction on one side of the press and then horseshoed around to enable additional forming in the opposite direction on the other side. This effectively doubles the length of the press ram. The system was installed so that an additional shuttle mechanism can be added easily for part transfer from one side to the other. Gobbling up scrap is an underground, out-of-sight conveyor system from Prab, Kalamazoo, MI. Three feeder trenches route scrap from each press to a main conveyor that deposits into one of two containers in an adjoining 5000-sq.-ft. scrap bay. The system communicates automatically to indicate when the containers must be switched out. Supporting the stamping operations are an onsite quality lab with 3D inspections, tool certifications, CAD comparison, dimensional analysis, and reverse engineering through PCDMIS-controlled CMM and portable laser scanning to ensure that customer quality expectations are met. The entire value stream from incoming material to in-process inspection and final audit are tracked via a quality system tied to the Plex (Troy, MI) ERP network. The new facility also provides full engineering support using VISI CAD/CAM software for tool building, and will be outfitted to perform all tool maintenance and repair with the ability to construct new tooling if needed. Initially, however, tool build will be sourced locally. Again, Hatch Stamping in Tennessee plans to duplicate the capabilities of its other plants, so it will be adding welding and assembly operations. Local sourcing points to a major reason why Hatch Stamping established its plant in Portland. The area is home to a host of industrial companies, including other stampers and machine shops. That makes not only for likeminded and convenient neighbors but also for a developed workforce. Utilities and governments have assisted with upping the power supply to the plant, which originally had been built for offices and light industrial use, and building an access road. In the meantime, Hatch Stamping’s industrial neighbors made their lots available for truck and employee access, and the company already has worked with local operations for machining, trucking and other needs while awaiting installation of its own equipment. See also: Linear Transfer Automation Inc., Nidec Minster Corporation, PRAB, Inc.